He is one of the earliest-appearing Bodhisattvas in Mahayana Buddhism. Vajrapani is the protector and guide of Shakyamuni Buddha and rose to represent the Buddha’s power. The Golden Light Sutra titles him „great general of the yakshas” (nature spirits). In addition, He is one of the earliest Dharmapalas and the only Buddhist Deity to be mentioned in the Pali Canon as well as be adored in the Tibetan Buddhism, Shaolin Temple, and even Pure Land Buddhism (where he is known as Mahasthamaprapta and is one of a Triad comprising Buddha Amitabha and Avalokiteshwara). Bodhisattva Vajrapani signifies the power of all the Buddhas just as Avalokitesvara (Chenrezig) represents their great compassion, Buddha Manjusri their wisdom, and Goddess Tara their miraculous deeds. For the yogi, He is a means of accomplishing fierce determination and signifies unrelenting effectiveness in the conquest of negativity. According to the Astasahasrikaprajnaparamitas and Pancaviṃsatisahasrika, any Bodhisattva on the path to Buddhahood is eligible for Vajrapani’s protection, making them untouchable to any attacks „by either men or ghosts”. He is the supreme dharma prince of all Tathagatas („one who has thus gone”), the very enlightenment-mind (bodhicitta) of all Tathagatas. Hence, He is the very supreme master of secrecy of all Tathagatas. Thus, He is given the title, the Vajra Holder, Lord of Secrets. Bodhisattva Vajrapani is portrayed holding a thunderbolt (vajra) in his right hand, which emphasizes the power to cut through the darkness of delusion. 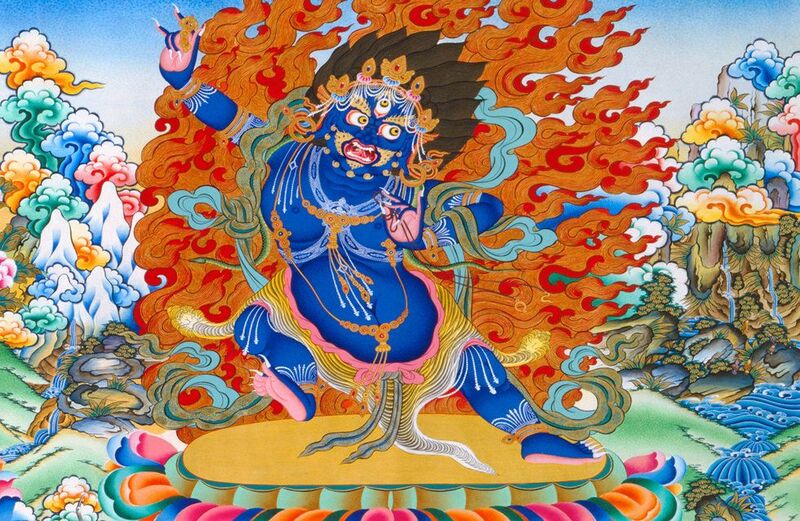 He looks wrathful, but as a representation of the enlightened mind, Vajrapani’s completely free from hatred, a similarity that Vajrapani has to a few Hindu Gods. It is also believed that He will become the last Buddha to appear in this world cycle. He is frequent grouped with the Chenrezig and Buddha Manjushri. The 3 celestial Bodhisattvas are thought of as arch-angelic defenders, representing the power (Vajrapanai), compassion (Chenrezig) and wisdom (Buddha Manjushri). This potent mantra is simply his name, which signifies „wielder of the thunderbolt”, surrounded by the mystical syllables Om and Hum. This powerful mantra helps us to gain access to the irrepressible energy that the Bodhisattva symbolizes. A familiarity with Vajrapani does, of course, help here, although the sacred sound of the mantra is itself rather energetic. This entry was posted in Buddhist Mantras on February 29, 2016 by admin.